Abstract. We report here the results of total mercury (HgT) determinations along the 2014 Geotraces Geovide cruise (GA01 transect) in the North Atlantic Ocean (NA) from Lisbon (Portugal) to the coast of Labrador (Canada). HgT concentrations in unfiltered samples (HgTUNF) were log-normally distributed and ranged between 0.16 and 1.54pmolL−1, with a geometric mean of 0.51pmolL−1 for the 535 samples analysed. The dissolved fraction (<0.45µm) of HgT (HgTF), determined on 141 samples, averaged 78% of the HgTUNF for the entire data set, 84% for open seawaters (below 100m) and 91% if the Labrador Sea data are excluded, where the primary production was high (with a winter convection down to 1400m). HgTUNF concentrations increased eastwards and with depth from Greenland to Europe and from subsurface to bottom waters. The HgTUNF concentrations were similarly low in the subpolar gyre waters ( ∼ 0.45pmolL−1), whereas they exceeded 0.60pmolL−1 in the subtropical gyre waters. 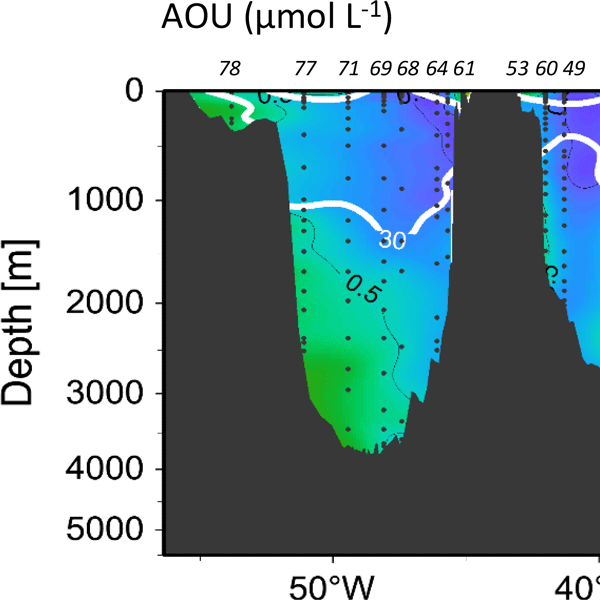 The HgTUNF distribution mirrored that of dissolved oxygen concentration, with highest concentration levels associated with oxygen-depleted zones. The relationship between HgTF and the apparent oxygen utilization confirms the nutrient-like behaviour of Hg in the NA. An extended optimum multiparameter analysis allowed us to characterize HgTUNF concentrations in the different source water types (SWTs) present along the transect. The distribution pattern of HgTUNF, modelled by the mixing of SWTs, show Hg enrichment in Mediterranean waters and North East Atlantic Deep Water and low concentrations in young waters formed in the subpolar gyre and Nordic seas. The change in anthropogenic Hg concentrations in the Labrador Sea Water during its eastward journey suggests a continuous decrease in Hg content in this water mass over the last decades. Calculation of the water transport driven by the Atlantic Meridional Overturning Circulation across the Portugal–Greenland transect indicates northward Hg transport within the upper limb and southward Hg transport within the lower limb, with resulting net northward transport of about 97.2kmolyr−1. How to cite: Cossa, D., Heimbürger, L.-E., Pérez, F. F., García-Ibáñez, M. I., Sonke, J. E., Planquette, H., Lherminier, P., Boutorh, J., Cheize, M., Menzel Barraqueta, J. L., Shelley, R., and Sarthou, G.: Mercury distribution and transport in the North Atlantic Ocean along the GEOTRACES-GA01 transect, Biogeosciences, 15, 2309-2323, https://doi.org/10.5194/bg-15-2309-2018, 2018. We first report the mercury distribution in the water section across the subpolar and subtropical gyres of the North Atlantic Ocean (GEOTRACES-GA01 transect). It allows the characterisation of various seawater types in terms of mercury content and the quantification of mercury transport associated with the Atlantic Meridional Overturning Circulation. 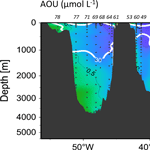 It shows the nutrient-like biogeochemical behaviour of mercury in this ocean.